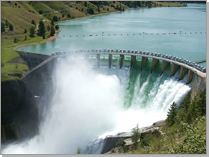 Hydro-electric Power Plant (Hydro-electric Energy) by Bankset Energy Hydroelectric, is Bankset Energy's developmental division and aims to provide state of the art engineering, design, construction and operations of medium to large scales Hydroelectric systems. 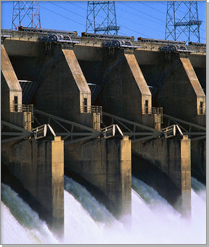 Hydroelectricity is the most widely used form of renewable energy. The energy of flowing water is utilised to produce electricity on a large scale at hydroelectric power plants. This is another conventional source of energy derived from flowing water. Dams are constructed across the waterfalls to derive electrical energy from it. Water flowing in high altitude rivers is stored in a man-made reservoir as shown in the figure. The kinetic energy of the flowing water is transformed into potential energy as the water level rises. This water is carried through pipes to the turbine situated at the bottom of the dam. The water turbine has cup-shaped discs around its circumference. A jet of moving water rotates the water turbine rapidly which in turn rotates the shaft which is attached to its centre. The other end of the shaft is connected to the coil of an electric generator. The generator coil rotates and produces electricity with capacity ranging from 50 MW to 20,000 MW. The Gordon Dam in Tasmania is an example of a large hydro facility, with an installed capacity of 430 MW nominal power.